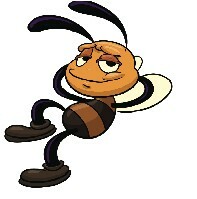 A honey bee family has females, males, and a queen bee. Most of the 50,000 honey bees in a beehive are female worker bees (with a sting). There are a few hundred male drone bees (with no sting). The queen bee is the biggest. 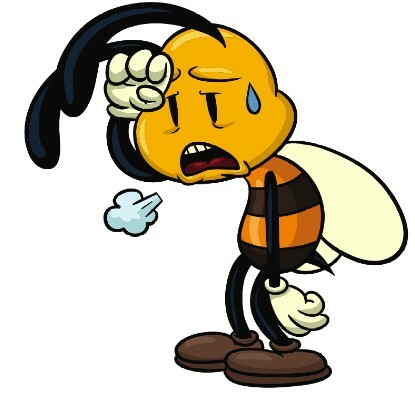 A female honey bee lives for about 6 weeks, but it’s a full life – she’s always changing jobs: a worker bee is a cleaner, babysitter, builder, chef, queen-groomer, air-conditioner, guard, undertaker, farmer, and scout. Her most exhausting job is visiting flowers to get food. A bee flies about 1000 km in her life, but it wears out her wings. Then she dies. Watch a video of a honey bee making a perfect landing. Drone bees spend most of their time eating honey. 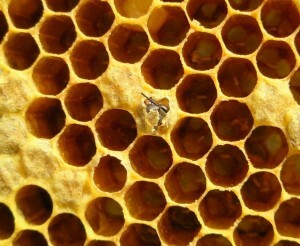 They even do their droppings in the hive and the females clean up after them. (Female bees always toilet outside). When winter kicks in the drones are kicked out. They exist only to mate with a new queen then the males die. 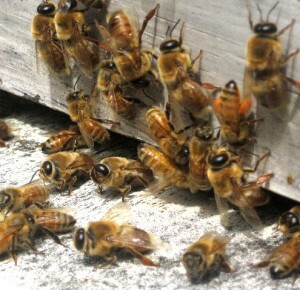 The queen bee is Her Royal Highness, constantly guarded, fed and groomed by her daughters. She lays up to 2000 eggs a day in the comb and lives for up to 5 years. When the queen gets old, the workers prepare a royal baby by feeding a larva on royal jelly. This food triggers the DNA to transform an ordinary bee into a queen – any girl bee can become a queen. Photo: Big-eyed drones sunbathing outside my hive.